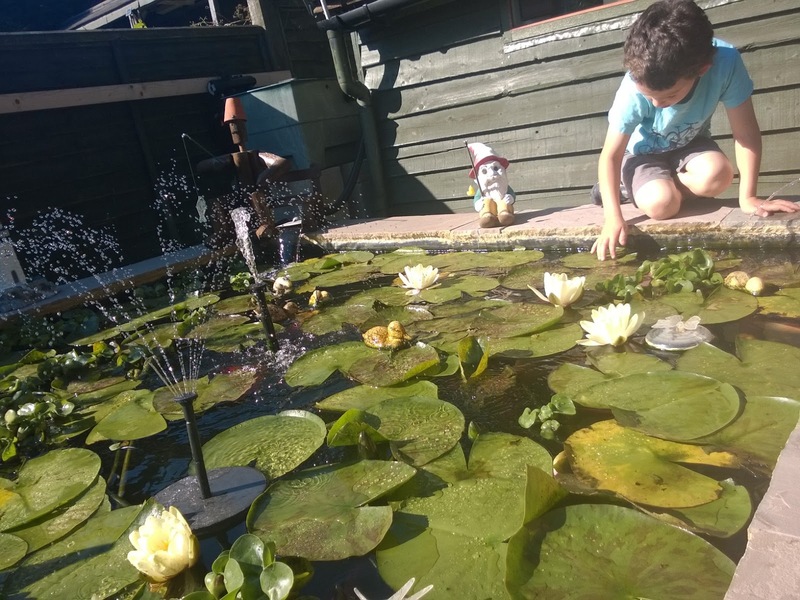 Can you spot the solar panel hiding behind the gnome? On our allotment we have inherited a small pond. It never has more than a couple of inches of water in it due to a very holey liner, and it's not a great shape as it is cut into the slope of the plot, so I have been searching for inspiration for how to make it into a really useful space for wildlife and for educational activities. This weekend we were really happy to be invited to visit the new home and even newer pond of family friends with years of pond building and maintenance experience. As well as being lovely to see them, it was a real eye-opener in terms of how much more enjoyment the kids got out of a raised pond where they could sit and peer in amongst the lily pads. It would certainly fix the problem of the pond at the allotment being on a slope since we would just have a top edge almost level with the ground and build up the level down the slope. It would also make it easier to either fence the area or embed safety mesh just below the surface which would allow frogs and pond insects access but hopefully make it safer for small two legged visitors. 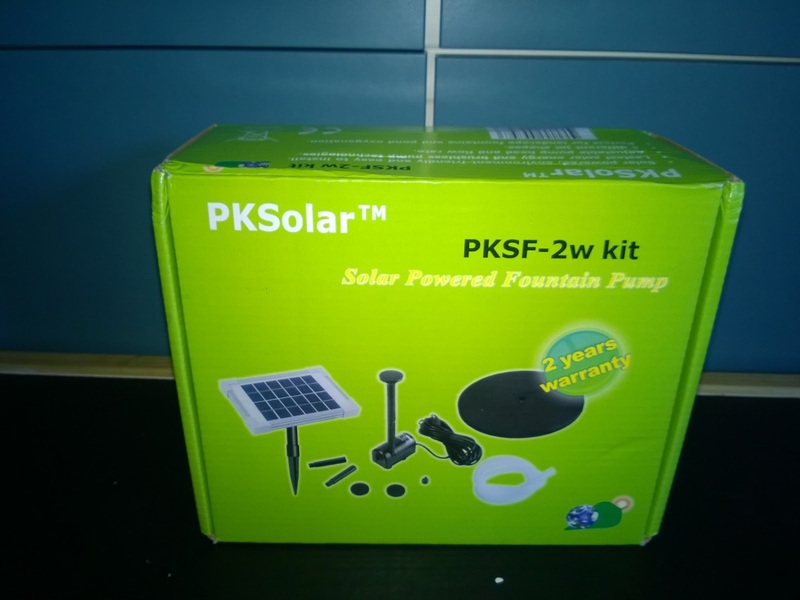 I was really pleased to be able to turn up to our friend's home with a useful gift for them in the form of a brilliant solar panel operated fountain pump kit from PKSolar. The fountain was out of the box and operating within minutes of us arriving, in fact it was so quick to work it nearly resulted in a face full of water. As well as being a pretty feature, the fountain will help to aerate the pond and keep the water moving, reducing stagnation and making the environment in the pond healthier for the fish and other pond inhabitants. The kids liked the gentle sound of the feature and the drops of water catching the light were really lovely. As well as being far quicker, easier and safer to install than a mains powered fountain, the fact that it operates from a solar panel means that it will automatically turn off at night. Having lived in the past with neighbours who had a noisy water fountain that ran all night I can attest to fountains turning off at night being a good thing. The solar panel was very discrete, smaller than the garden gnome it was tucked behind. I think that when we get one for our pond improvement it would be therefore be fairly secure at the allotment as it is likely to go unnoticed (unfortunately regular thefts of tools and produce are a problem on our site). The PKSolar website also gave me other ideas however as the pump is supplied with tubing which means we could use it to make a smaller water feature for our patio which would help to bring wildlife to our tiny garden at home. I have my eye on the solar pond aerator on the PKSolar website too, but not necessarily for pond use. I have been reading about the benefits to soil fertility of using 'compost tea' and the production of this requires several fish tank aerators. I'm thinking that surely a single pond aerator would provide the necessary oxygen to promote a healthy balance of compost micro-organisms which would in turn build up healthy soil communities and benefit our crops. Whatever improvement we do manage to make at our plot, we will always be grateful to our friends for giving us inspiration from seeing a really beautiful and well managed pond. I hope they have many happy years in their new home enjoying the fish and the lilies and the relaxing sound of moving water. Note: We received the fountain from PKSolar in return for an honest review. Opinions images and fascinated kids are all my own, the beautiful pond is our friend's. The boys were closely supervised at all times when near the water and if you're planning a water feature in a family garden used by children under 6 years old it's worth giving serious thought to safety. Advise on ponds from RoSPa available here. 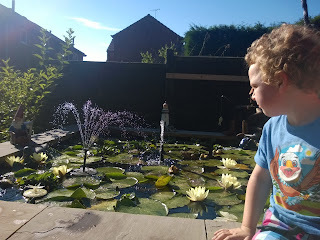 If you have small children, using a solar pump kit to produce a shallow water feature such as the one shown on the PKSolar website would provide drinking water for birds and other garden visitors without the associated risks of a full sized pond.